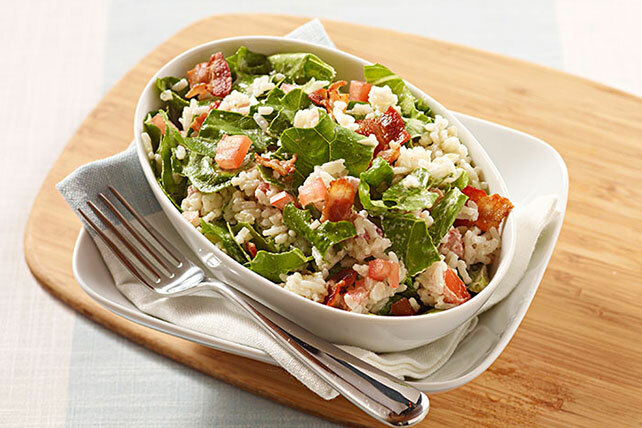 Torn lettuce leaves, chopped tomato, crumbled bacon and mayo are stirred into cooled, cooked rice for a colorful, creative and delicious salad. Cook and stir bacon in large skillet on medium heat until crisp. Remove bacon from skillet with slotted spoon; drain on paper towels. Discard all but 2 Tbsp. drippings from skillet. Add onions to reserved drippings in skillet; cook and stir 3 to 5 min. or until crisp-tender. Stir in water; bring to boil. Add rice; stir. Cover. Remove from heat; let stand 5 min. Fluff with fork. Cool to room temperature. Spoon rice mixture into large bowl. Add lettuce, tomatoes, mayo and bacon; mix lightly. Enjoy this serving of salad at a summer get-together with a serving of your favorite grilled meat. The rice mixture can be prepared ahead of time. Refrigerate up to 8 hours. Add lettuce, tomatoes, mayo and cooked bacon just before serving; mix lightly. This flavorful salad can easily be doubled. Prepare as directed, doubling all ingredients. Prepare recipe as directed, cutting all ingredients in half. To Double: Prepare recipe as directed, doubling all ingredients. To Halve: Prepare recipe as directed, cutting all ingredients in half.